Hey guys! We are over Simply Klassic Home today guest posting about how to market your blog! You won’t want to miss this series! That was so great and I have been wondering how to have my name show up as @miss information. Little did I know I was using the wrong profile, thank you! One more question is how do you do those cute buttons to link to your facebook, pinterest, etc. I will check it out now! Thanks so much for the tips! 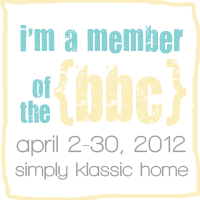 I’m your newest follower from Simply Klassic Home! Just popped on over from Kristin’s blog to thank y’all for a great post today – I’ve also added you to my Reader so I’ll be commenting more often. Love your blog, BTW! !